There is no doubt that studying vocabulary is the basis of all kinds of language ability tests. Achieving high scores can be accomplished when you have good reading & listening comprehension that are based upon vocab skills. You can be a high score holder in Japanese with '30Day Japanese Words'. + A new paradigm, an application for studying '30Day Japanese Words'! Have you been struggling in memorizing Japanese Words? Our '30Day Japanese Words' will help you memorize Japanese words way more easily, efficiently, and continuously. With the help, you will decide the number of words you will memorize daily, set your own study schedule, and make’em yours! We have selected approximately 2.000 words, which appear on the test the most frequently, from N1 to N5. You can also learn the accurate pronunciation and standard accent of each word, referring to the native speaker whose voice has been recorded in the application. First, decide how many days you will spend to study approximately 2000 words, or how many of them you will study daily. 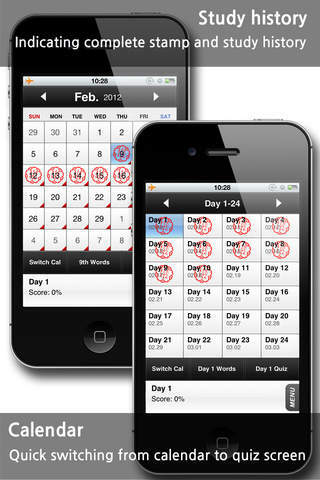 The amount of daily study and the period of overall study will be automatically calculated. -‘Write for memorizing’: you can write the words on our application to help the process of memorizing. 4.Incorrect answers from the quiz and words that are hard to memorize will be added to your favorites list with the stars. You can check out the words any time you want! 5.Double-check the words you have studied before to make sure they are yours! The basic guideline is as it’s stated above. It’s recommended to find out the best study style for you and keep yourself on the right track. It is very important to study vocabs every day. 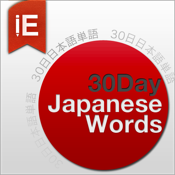 Be a high score holder in JLPT with '30Day Japanese Words'!! !